Free Printable Hawaiian Luau Crossword Puzzle. Free Printable Hawaiian Luau Crossword Puzzle, a free printable game to have fun with your guests at the Luau party or feast. Use this Crossword to learn more about Hawaiian Luau. Print it free using your laser or inkjet printer and have fun solving 12 Hawaiian Luau related questions. Let’s see how much you know about Luau. Find luau related stuff like Kaekeeke, Taro, Kamehameha II, Hula, Lei, Imu, Ukulele, Fire Poi Ball, and more. Includes answers on page 2. 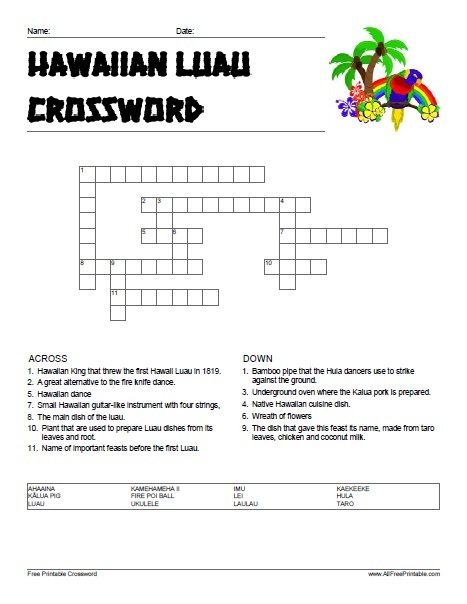 Click the link below to download or print the Hawaiian Luau Crossword Puzzle now in PDF format. Dance and have fun at the LUAU PARTY!